This past weekend was the baby shower for my cousin, Sarah. Remember the baby shower invitations I posted previously? I made my very first diaper cake! It was extremely easy. I found this great video tutorial on how to make them. Click here to watch the video. I put a ribbon around each layer that I picked up on clearance at Joann's and then cut three circles out of coordinating scrapbook paper and cut slits into the center to add a bit of depth to each one. I hot glued buttons, from my stash, to the center of each circle. 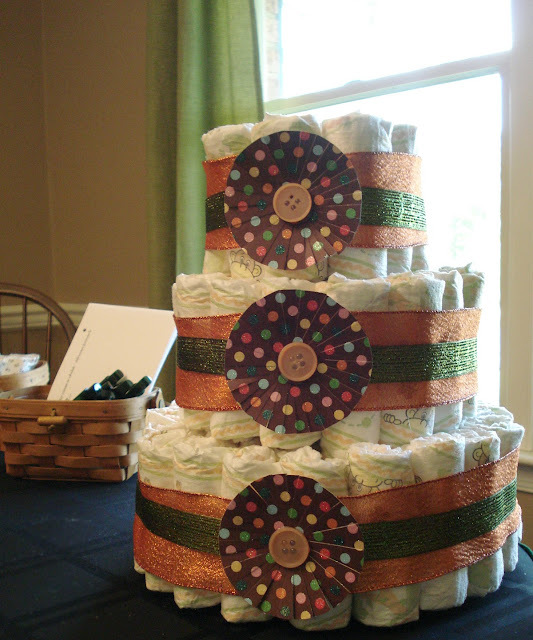 These diaper cakes make a great addition to the baby shower decor and also double as a gift for the new mom. You come up with the neatest stuff and it certainly is a lovely compliment to any party.